I was so disappointed when I went outside this morning to go to school. I couldn’t see any yellow dandelions – only fluffy seed on top of stems where the flowers used to be. And I knew there were lots of dandelions around only a day or two ago. 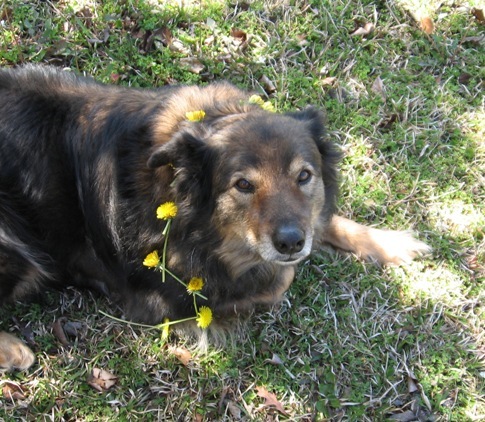 Here is my dog Missy standing behind a clump of dandelions with seed heads sticking out. 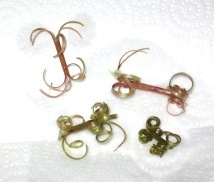 I can’t make a pretty dandelion chain with only seed heads, but I could still make the curly-Qs, because they are made using only the stems. You need only your fingernails and a cup or jar of water. An empty mayonaise jar is perfect, but any kind of container will work. Cut several dandelion stems with either flower or seed heads on them. Then cut the stems into pieces about three or four inches long. 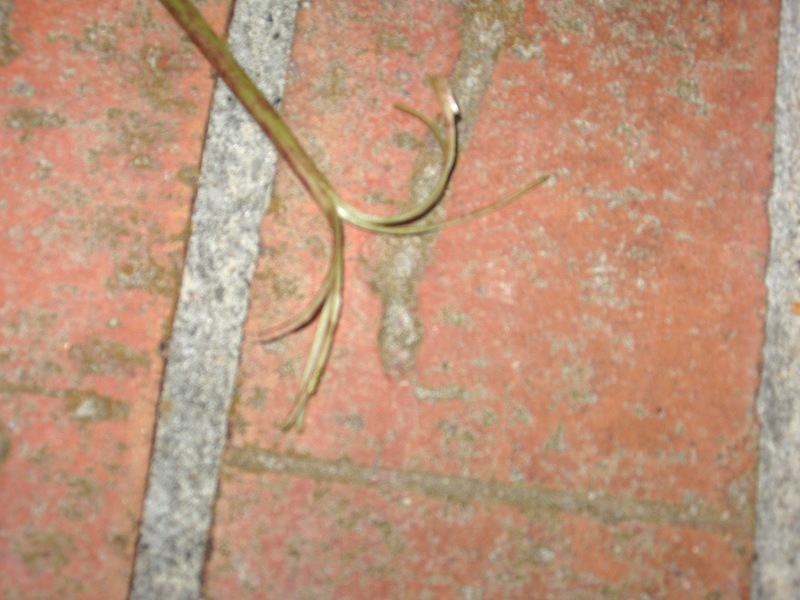 Using your fingernails split the stem on one end into several strips so it looks something like a palm tree. Then repeat the process on the other end of the stem. The more strips on each end of the stem, the more curl you will get. 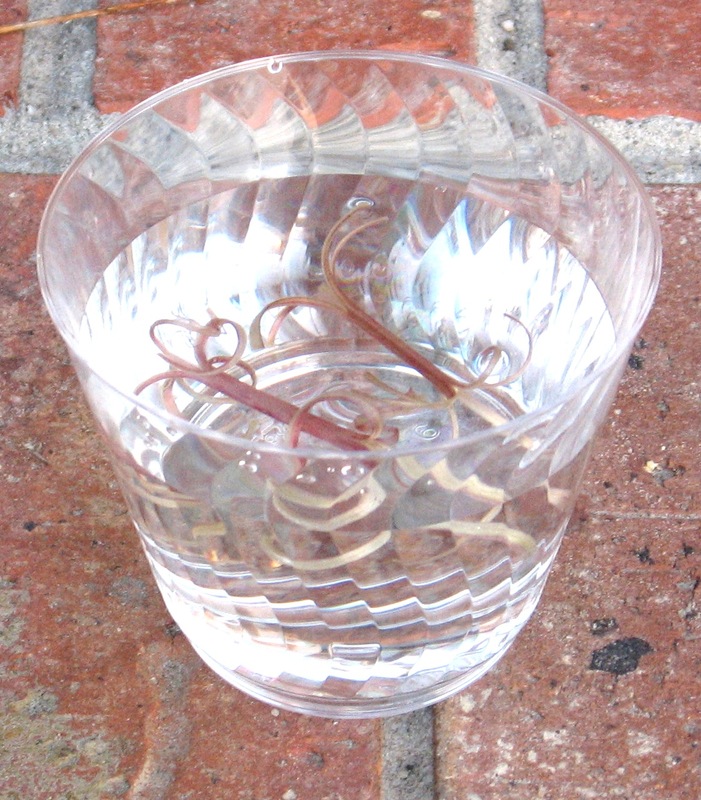 Drop your split stems into the water cup or jar and watch the strips curl up. Use them for decorations or just have fun watching them curl up. Here are some pictures of how they look. As I was picking the dandelion stems I noticed that there were dandelion flowers that were not opened. I think maybe they open in only the warmest and/or sunniest part of the day and then close back up until late morning the next day.